Any temporary resident (i.e. vacationer) of Tobyhanna or Tunkhannock townships may acquire borrowing privileges by paying a $20.00 (nonrefundable) annual user fee per individual. Any resident (permanent or temporary) of any other county in Pennsylvania may acquire borrowing privileges by paying a $20.00 (non-refundable) annual user fee per individual. Any resident of Pennsylvania, who has a library card from their home library with an ACCESS Pennsylvania sticker, may obtain a library card at no charge. Otherwise, a $20 per year per person charge applies. Proof of residency is required. Adult cards are issued to individuals 18+. Student cards are issued to anyone younger than 18 and require a parent or legal guardian signature with proof of residency. Library cards are non-transferable and must be used by the individual to whom the library card is registered. Immediate notification of change of address, phone number, or email address is required. Books, audio materials, back issues of magazines, and educational DVDs circulate for two weeks. Music CDs circulate for one week. Non-educational DVDs circulate for three days/two nights. All items are due back on the due date prior to the library closing. to patrons 18 years or older for two (2) days. Overdue fines are $1.00 PER DAY PER MOVIE. There is a limit of three (3) movies per individual. Movies may be returned in the outside book drop (or at the community dropboxes). Movies returned after closing on the date that they are due will be considered as returned the next day. * Patrons under 18 years old may acquire the privilege to borrow movies if a parent or guardian signs a permission/accountability contract. Library materials can be renewed by bringing the items into the library, by phone, or online by logging into the patron account. If there is a waiting list for an item, it may not be renewed. Books, audiobooks, and magazines may be renewed two (2) times; movies (DVD) and the Kindle e-book reader can be renewed one (1) time. An overnight book drop is located by the library entrance for your convenience in returning materials when the library is closed. All materials may be returned in the overnight drop box, with the exception of the Kindle e-book reader. Remote drop boxes are also located in the community at the Tunkhannock Township Building (Long Pond Post Office) and at the Blakeslee Post Office. If you return your items to either of these community drop boxes by the date the item is due, you will not be charged overdue fines. Overdue fines are 25 cents per item per day on books, audiobooks, and magazines in both the adult and children’s departments. Overdue fines for movies and the Kindle e-book reader is $1 per day per item. Items dropped in the drop box after the library has closed are considered late, and an overdue fine will be charged to the patron’s account. Fines are only calculated on the days that the library is open; patrons will not be charged additional days if the library is closed for any reason as long as the item is returned the next day. All cards will be restricted when fines have accumulated to $2.00; fines must be paid down below the $2.00 limit to borrow materials. All fines must be completely paid down to $0 in order to use our computers. The Clymer Library board enacted a policy to use a collection agency to help encourage patrons with overdue materials to return them to the library. The Library Board voted to pass the cost of this service on to each patron whose account will be handled by the collection agency. The library will still notify patrons that their materials are overdue. Patrons will have ample time to respond prior to being turned over for collections. Unique Management Services has been selected as the collection agency for the library. 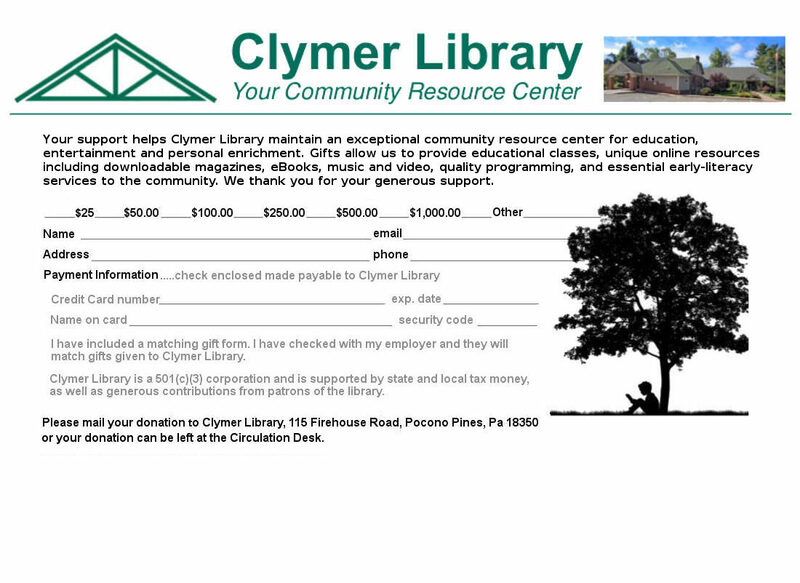 Clymer Library is serious about recovering overdue materials. Patrons who do not return materials are stealing from the library. Fortunately, only a very small percentage of patrons using the library do not return materials. This new policy will not affect the vast majority of patrons who return materials on time. The library is committed to providing excellent service and having materials available that patrons desire. A person shall receive three (3) notices to return library property that is overdue. At least one (1) notice shall be written and shall contain a demand that the property be returned. Overdue notices which are ignored will be followed by a bill for the replacement value of the property PLUS a $5.00 processing fee for each item. Any person who ignores the written notices, and continues to retain library property SHALL BE PROSECUTED. Parents and/or legal guardians are responsible for overdue materials charged-out onto student cards. Borrowing privileges will be suspended for unpaid fines, materials returned damaged, and lost items until patron pays late fines and/or fines for lost and damaged materials. Borrowing library materials implies both privilege and responsibility. Your signature on your application means you accept responsibility for materials that you borrow. If a borrowed item is damaged, individuals are responsible for the cost of the book plus a $5.00 processing fee. If the barcode or book cover is damaged, a $5.00 processing fee will be charged. Computer usage is a privilege. If a patron has any fines or unreturned overdue materials, they will not be permitted to use a computer. According to Pennsylvania Statutes Title 24 Education, Chapter 16 Libraries, Article IV, all records related to the circulation of library materials shall be confidential and shall not be made available to anyone except by a court order in a criminal proceeding.